Mars dominates our southern evening sky but most of the other bright planets are poorly placed this month. Even so, our October nights are full of interest, from the Summer Triangle in the evening to the star-fest around Orion before dawn. Although Mars dims from magnitude -1.3 to -0.6, its reddish light remains prominent as it moves from low in the south-south-east at nightfall to the south-south-west at our map times and onwards to set in the south-west a little before 01:00 BST (midnight GMT). As its distance grows from 89 million to 118 million km, and its diameter shrinks from 16 to 12 arcseconds, the planet speeds through Capricornus to climb 6° northwards and that much higher in our sky. Catch it to the left of the Moon on the 17th and below-right of the Moon on the 18th. The Sun tracks 11° southwards as Edinburgh’s sunrise/sunset times change from 07:15/18:48 BST (06:15/17:48 GMT) on the 1st to 07:17/16:35 GMT on the 31st. The Moon is at last quarter on the 2nd, new on the 9th, at first quarter on the 16th, full (the Hunter’s Moon) on the 24th and back at last quarter on the 31st. 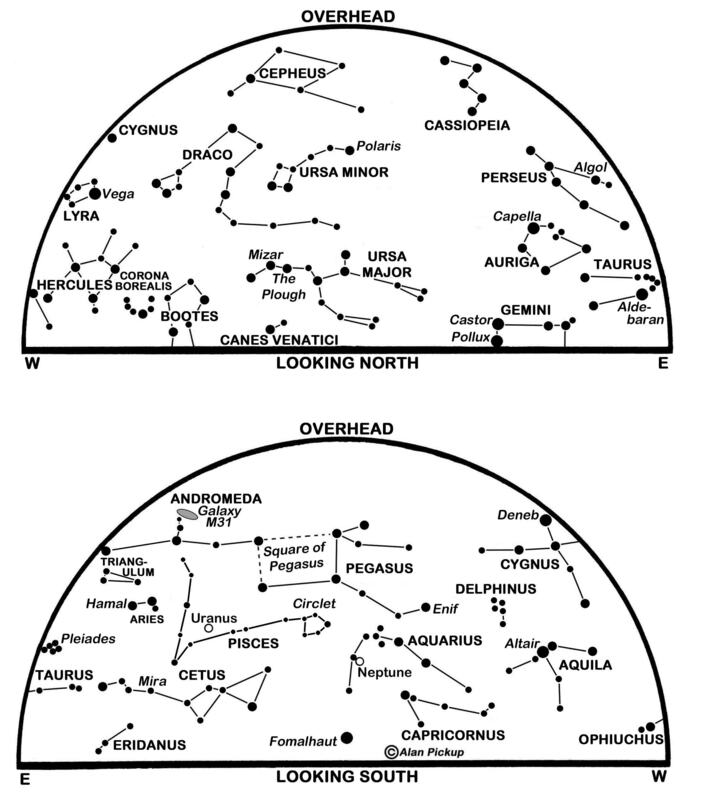 Our charts show the Plough in the north as it moves below Polaris, the Pole Star. Mizar, in the Plough’s handle, forms a famous double star with the fainter Alcor – the pair being separated by about one third the diameter of the Moon. Once held as a (not very rigorous) test of eyesight, they were dubbed “The Horse and Rider”. Both lie 83 light years (ly) from us although we can’t be certain that they are tied together by gravity. In any case, we are not talking about just two stars, for Alcor has a faint companion and most telescopes show Mizar to be a binary star – the first to be discovered telescopically in the 17th century. Spectroscopes reveal that each of Mizar’s components is itself binary, so Mizar and Alcor, if they are truly associated, together form a sextuplet star system. Mizar is the same brightness, magnitude 2.2, as Eltanin which lies 14° to the right of Vega and very high in the west at nightfall, falling into the north-west overnight. It is the brightest star in Draco and a member of a quadrilateral that marks the head of the Dragon whose body and tail twist to end between the Plough and Polaris. It lies 154 ly away but is approaching the Sun and will pass within 28 ly in another 1.5 million years to become the brightest star in Earth’s night sky. Meteors from the Draconids shower diverge from a radiant point that lies close to Draco’s head (see our north map) between the 7th and 10th. Don’t expect a major display – perhaps no more than 10 meteors per hour, though all of them are very slow as they glide away from the radiant. The shower’s peak is due in a moonless sky around midnight on the 8th-9th and is worth checking because some years surprise us with strong displays and the shower’s parent comet, Comet Giacobini-Zinner, was visible through binoculars when it swept within 59 million km last month. A better-known comet, Halley, is responsible for the meteors of the Orionids shower which lasts from the 16th to the 30th and has a broad but not very intense peak of fast meteors between the 21st and 24th. The radiant point, between Orion and Gemini, rises in the east-north-east soon after our map times and passes high in the south before dawn. Sadly, the peak coincides with the full moon, so don’t expect much of a show. From high in the south at nightfall, the Summer Triangle (Vega, Deneb and Altair) tumbles into our western sky by the map times. By then, the less impressive and rather empty Square of Pegasus is in the south and Taurus and the Pleiades star cluster are climbing in the east. Orion rises below Taurus over the next two hours and crosses the meridian as the night ends. Neptune and Uranus, now well placed in the evening, may be located through binoculars using better charts than I can provide here. A web search, for example for “Neptune finder chart”, should help. Neptune shines at magnitude 7.8 and lies in Aquarius at a distance of 4,342 million km on the 1st. Uranus is 2,824 million km away in Aries, near its border with Pisces, when it stands opposite the Sun in the sky (opposition) on the 24th. Although the full Moon stands close to it on that day, its magnitude of 5.7 makes it just visible to the unaided eye under a good dark and moonless sky. October should see the launch of the European Space Agency’s BepiColombo mission to Mercury, but the planet itself is too low in our evening twilight to be seen. Venus sweeps around the Sun’s near side at inferior conjunction on the 26th and remains hidden in the Sun’s glare. Jupiter is bright (magnitude -1.8) but less than 8° high in the south-west at sunset as the month begins. One of our last chances of spotting it in our bright evening twilight comes on the 11th when it lies 4° below-left of the young earthlit Moon. Saturn, magnitude 0.5 and edging eastwards in Sagittarius, stands less than 10° high above Edinburgh’s south-south-western horizon as the sky darkens and sets in the south-west some 45 minutes before our map times. Look for it to the left of the Moon on the 14th. This is a slightly revised version, with added diary, of Alan’s article published in The Scotsman on September 29th 2018, with thanks to the newspaper for permission to republish here. As we plunge into the final quarter of the year, our lengthening nights offer a procession of stellar views that stretch from the Summer Triangle in the evening to the stunning star-scapes around Orion during the morning hours. The brighter planets, though, are on show only low down around dusk and dawn. The middle of the Summer Triangle stands some 60° high and due south as darkness falls tonight. Its brightest corner star, Vega in the constellation Lyra, lies just south-west of overhead, while Deneb in Cygnus is even higher in the south-east and Altair in Aquila lies below them on the meridian. With no hindering moonlight over the next few evenings, now is a good time to spy the Milky Way as it arches almost overhead after dusk, climbing from Sagittarius on the south-south-western horizon and flowing through the heart of the Triangle on its way to Deneb and the “W” of Cassiopeia high in the north-east. Of course, unless we can find a dark site, away from the pollution of street lighting and the like, we may have trouble seeing the Milky Way or indeed any but the brighter stars on our chart. Edinburgh’s sunrise/sunset times change this month from 07:16/18:47 BST (06:16/17:47 GMT) on the 1st to 07:18/16:34 GMT on the 31st after we set clocks back one hour with the end of BST on the morning of the 30th. The Moon is new on the 1st, at first quarter on the 9th, full on the 16th (the hunter’s moon), at last quarter on the 22nd and new again on the 30th. Venus stands nearly 5° high in the south-west at sunset and sets itself only 43 minutes later on the 1st. By the 31st it is barely a degree higher in the south-south-west at sunset but remains visible for 73 minutes so is easier to spot if we enjoy an unobscured outlook. It blazes at magnitude -3.9 and stands 4° below-right of the slender earthlit Moon on the 3rd when its gibbous disk appears 12 arcseconds wide and 85% sunlit if viewed telescopically. In the month that the first European-Russian ExoMars spacecraft reaches Mars, the planet is the brightest object low in the south-south-west as the twilight disappears. ExoMars consists of a Trace Gas Orbiter to study rare gases, and particularly methane, in Mars’ atmosphere and it also has the experimental Schiaparelli lander. Mars fades slightly from magnitude 0.1 (almost equal to Vega) to 0.4 this month as it tracks 21° eastwards above the so-called Teapot of Sagittarius, clipping the top star of the Teapot’s lid (Kaus Borealis) on the 7th. The planet recedes from 160 million to 187 million km during October while its gibbous disk shrinks to 7.5 arcseconds in diameter which, with its low altitude, makes telescopic study all the more challenging. It lies below the Moon on the 8th. A little fainter than Mars, and a little lower to Mars’ right in this evening’s sky, is the ringed planet Saturn. This shines at magnitude 0.6 in southern Ophiuchus and appears 16 arcseconds across, with its glorious rings spanning 36 arcseconds. Saturn lies to the left of the earthlit Moon on the 5th and dips lower with each evening until it is passed by Venus late in the month – catch Saturn 3° above Venus on the 29th. By our map times, both Saturn and Mars have set and the Summer Triangle has toppled over into the west. High in the south is the Square of Pegasus, a line along its right-hand side pointing down to the southern bright star Fomalhaut in Piscis Austrinus the Southern Fish. Just to the right of this line, and 2° south-west (below-right) of the star Lambda Aquarii (magnitude 3.7), is the farthest of the Sun’s planets, Neptune. At magnitude 7.8 and a distance of 4,350 million km on the 1st, we need binoculars and a better chart to identify it, and probably a large telescope to glimpse its bluish disk only 2.3 arcseconds wide. To the east of Aquarius lies the constellation of the two fish, Pisces, and the second most distant planet, Uranus, which stands directly opposite the Sun at opposition on the 15th at a distance of 2,835 million km. At magnitude 5.7 it is near the limit of naked-eye visibility under the darkest of skies, but is an easier binocular or telescope target with its diameter of 3.7 arcseconds. Orion rises in the east less than two hours after our map times and strides across the meridian before dawn. To its north and east lies Gemini and between the two is the radiant point for the annual Orionids meteor shower. This is visible during our morning hours throughout the second half of the month and peaks at rates around 25 meteors per hour between the 21st and 24th. Its meteors are swift, with many leaving glowing trains in their wake, and represent the dusty debris laid down by Halley’s Comet. The night ends with Mercury which is conspicuous at magnitude -0.7 and rises in the east 109 minutes before the Sun on the 1st, climbing to stand 9° high forty minutes before sunrise. By the 11th, as its favourable morning show draws to a close, it rises 76 minutes before sunrise. On that morning, the even brighter Jupiter lies only 0.7° below-right of Mercury as the giant planet climbs away from the Sun’s far side. By the 28th, Jupiter rises at about 05:40 BST and is an impressive sight 1.5° below the earthlit waning Moon. This is a slightly-revised version of Alan’s article published in The Scotsman on October 1st 2016, with thanks to the newspaper for permission to republish here. Journal Editor’s apologies for the lateness of the article appearing here.